City Tour Limo Service Minneapolis- Fast, Reliable, Affordable & Fun! Limo service Minneapolis – for the first class experience. If you are visiting from another location or even a current resident to Minneapolis, 1st Class Transportation offers a highly affordable city tour limo service. We understand that navigating through Minneapolis can be a bit difficult at times. That’s why we like our customers to relax and enjoy the scenery as we drive through the skyline of Minneapolis. Passing famous landmarks and interesting places, you will be amazed. This option is perfect for individuals who want to relax and enjoy the beautiful Minneapolis/Twin Cities area. Our city tours are among the best to get the full scale of how much Minneapolis has to offer tourists. 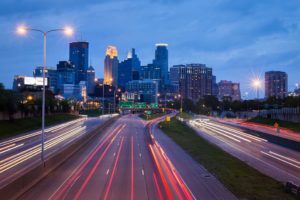 If you are looking for just a simple city tour limo service to enjoy a day out in Minneapolis, or a more intricate city tour with many different places to see, we can tailor anything to your specific needs. Experience: Above all, our chauffeurs know all the ins and outs of the Minneapolis area. We know just where to take you so you can see all the spots. Safety: Navigating through the cities can be difficult and even dangerous if you aren’t familiar with the area. You can take comfort in knowing you’ll be safe and comfortable in our top of the line vehicles. If you are looking to do a city tour limo service and want to use a party bus or a limo, depending on the size of your party, we can easily do that. Our fleet is one of the top of the line in the nation, and we understand that having the best vehicles available gives you the best experience for any occasion, be it with a city tour limo service, wine tour, or even a brewery tour. Click Book Now below to reserve your exciting city tour limo!